The South Australian Derby, one of the last Group 1 race of the autumn racing season in Australia, is coming up on the weekend, with the final nominations expected to be declared on Tuesday. The race, which pits together some if the finest three-year-olds in the country, routinely provides an interesting spectacle, as the majority of the horses in the race are first timers over in a staying event. The field assembled for this year’s race promises to be a strong one, with the horses already certain to be in the race shaping up towards the top of the betting markets. 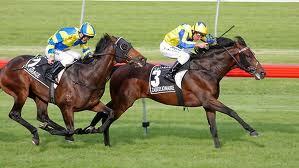 The best place to have a bet on the 2014 South Australian Derby is with Bet365.com. The odds below were taken from the site, and you will be able to find the latest race odds there as well. Bet365.com is also offering each-way betting on the race, with which you will receive 1/4 if should your selection place in positions one to three. The biggest news coming in over the weekend was the Order Of The Sun, Gai Waterhouse’s favourite in the race, will be saddled by Vlad Duric. Order Of The Sun has been attracing a lot of interest in the betting markets leading up to the race following his impressive victory in the VRC St Leger last week, and Waterhouse must be confident of adding another victory to an already positive autumn campaign, which has come on the back of her triumphant Melbourne Cup season with Fiorente. The St Leger win will have been an important sign for Waterhouse, after her horse had disappointed in the last few months, failing to place in his last three races, having last won in February. Ken Keys’ Bring Something is also shaping up as a strong contender for the race, and will be aiming for his third win on the trot, and will enter the race as the form horse after picking up two victories in the last month, notably the only two victories of Bring Something’s career. The only other horse under 6.00 at this stage of the week is local trainer Richard Jolly’s Kushadasi. The Choisir colt boasts an impressive record, having won in four of his nine starts, and only twice finishing below second place, including his last effort in the Chairman’s Stakes, where he finished just out of the places in fourth. His last win was just a month ago, however, and he will be pushing the leaders all the way to the finish line. As mentioned above, the best racebook to place a bet on the 2014 South Australian Derby is Bet365.com, who will offer the best odds on the race. When visiting Bet365.com, click on ‘Horse Racing’ in the left sidebar and scroll down to the Antepost section of the page, where you will find the markets for this race and many more. The South Australian Derby is a Group 1 race for three year old horses with set weights, and is run over a distance of 2,500 metres at Morphetville Racecourse in South Australia. The race offers prize money worth $500,000 and was won by Escado in 2013.